Just Genesis : Who Wrote Genesis? Who wrote Genesis? That important question can’t be answered definitely, as there is still so much we don’t know about the dating of the material. However, an inter-disciplinary approach to the question poses some satisfying, if not fully verifiable, answers. In this first essay in a series on the authorship of Genesis, we will consider the challenges we face when trying to date the Genesis material. The wife of Lamech the Younger belongs to Noah. She is the mother of Noah of the flood. Though she is not explicitly named, we detect her pedigree through the name she gave to her first-born son. With this information, we come to see that the hero of the flood is the descendent of Seth, by a daughter of Nok, and the child of a daughter of Noah. This is significant because it reveals the existence of 3 African kingdoms related by blood and existing at the same time. These kingdoms existed before the material was organized in the form we have received it. Much of the narrative of Genesis is anachronistic, being told well after the time these people lived. This is evident in phrases such as “The Canaanites were in the land.” (Gen. 12:6) This means that the period represented by the people in Genesis 4 and 5 must be before the time of Abraham, Moses, David and the Babylonian captivity. This Lamech, designated "the Younger" by E. A. Speiser, is the father of Noah of the flood. My diagram and analysis of this material reveals that the two lines are distinct yet inter-related by marriage of the daughters (who are not listed). The daughters married their patrilineal parallel cousins and named their first-born sons after their fathers. (See: http://jandyongenesis.blogspot.com/2007/11/where-did-cain-find-his-wife.html) The key to understanding the pattern is Naamah, Lamech's daughter. She married her patrilineal parallel cousin Methuselah (Gen. 5:26) and named their first-born son Lamech, after her father. This pattern is evident throughout the Genesis 4 and 5 genealogical record. Likewise, Cain's daughter married her cousin Enosh and named their first-born son Kenan. "Kain" (or Cain) and "Kenan" are linguistically equivalent names. Irad's daughter married her cousin Mahalalel and named their first-born son Jared. Irad and Jared are linguistic equivalents. 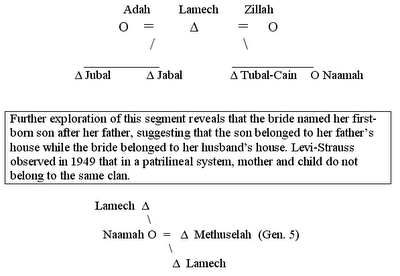 Methushael's daughter married her cousin Enoch and named their first-born son Methuselah, again linguistic equivalents.Factoring the daughters into the genealogical picture clarifies the kinship pattern of Abraham's ancestors. The consistency of the pattern throughout Genesis 4 and 5 supports the biblical claim that this genealogical material presents biological father-son descent rather than a telescopic view, and it is not a case of literary doublets. Now where do we find the pattern today? It is found among groups in West Central Africa. It is a unique pattern, a kind of cultural signature of clans and metal working chiefs in Niger, Nigeria and in the grasslands of Cameroon (See the research of Emmanuel Vubo, here: http://www.africa.kyoto-u.ac.jp/kiroku/asm_normal/abstracts/pdf/26-3/26-3-2.pdf). The biblical support for this appears in Psalm 8:4 which reads, “What is man [enosh] that you are mindful of him, the son of man [ben adam] that you care for him?” The parallelism of the Hebrew makes it clear that the historical Enosh is regarded as progenitor just as the archetypal Adam is regarded as progenitor. Using the Nok connection and Noah’s flood as our points of reference, we can propose a time period for the people listed in Genesis 4 and 5. They would have lived between the time of the central African chief, Nok, and before the flooding that took place throughout the Afro-Asiatic Dominion (http://jandyongenesis.blogspot.com/2007/11/linguistic-evidence-for-afro-asiatic.html). Noah’s flood likely occurred during the Guirian Wet Period, which lasted from about 5500 to 2550 B.C., and the artifacts of Nok suggest that the founding of that civilization can’t be dated before about 2550 B.C. Wherever we place the noble clans of Genesis 4 and 5 in history, it is clear that they do not pertain to the dawn of humanity. The evidence suggests that 3 lines inter-married: the lines of Sheba, Nok, and Noah, and these represent historical people who lived in West Central Africa between about 10,000 and 8,000 years ago. This helps us in determining the author of Genesis because it poses a key question: Who would have had access to this information? If Genesis is the record of God’s intervention among Afro-Asiatics before the emergence of a people called Israel, it is a record of distant antiquity. This poses the challenge of constructing a picture of the ancient world to which the Genesis prehistory alludes. Until recently, the picture has been one of Mesopotamian peoples from whom Abraham is selected by God to have a special covenantal relationship. But what if Abraham’s ancestors didn’t come from Mesopotamia? What if they came out of Africa, as the pedigree of Genesis 4 and 5 suggests? Then we must look for clues to help us understand the relationship between the Mesopotamian context of Abraham and the African context of his ancestors Cain, Seth and Noah. There are 2 ways to approach this. We may assume that the similarities between the sacred stories of the ancient Fertile Crescent and the Indus River are due to a westward migration of Semite nobles. If this is the case, than the Genesis prehistory takes part of the story from pre-Vedic legends of creation and early humanity. This would account for the correspondence between the Hindu heroes Adimo, Heva, Sherma, Hama and Jiapheta and the Genesis persons Adam, Eve, Shem Ham, and Japheth. But what if the reverse is true? What if the correspondence is due to the eastward movement of Abraham’s ancestors from West Central Africa to Ur and Haran? This is the more likely scenario given everything we know about the northeast migrations of peoples from Africa to Mongolia. If the migration is eastward and the stories reach as far as the Indus River Valley, these stories must be viewed as a seedbed of the Afro-Asiatic Dominion, a vast civilization that extended from West Central Africa to India, far too large an area to be able to identify a clearing house for all this information. However, there is a time in Israel’s history when all this information was greatly valued: during the reign of King David, whose ancestry is Afro-Asiatic. This is why some scholars propose that the material in Genesis was compiled around 1000 B.C. This makes sense when we consider that during David’s reign commerce and cultural exchange was directed both toward African kingdoms and toward the Mesopotamian kingdoms, and there was a good deal of interest in pedigree to validate David’s claim to the throne. Jinni, Coming from someone who lives in Jos and is familiar with the Nok culture, I consider your comment very encouraging! In your proposed documentary on Nok, feel free to use whatever information you find at this site that may be helpful. I ask only that you attribute what you use to Just Genesis and Alice C. Linsley. Best wishes! Doesn't the bit about "Adimo," etc. come from the Ezourvedam, and wasn't that a forgery? Ezourvedam wasn't so much a forgery as an 18th century French veda which speaks of "Adimo", the Sanskrit word for first man. Adimo is said to have sprung from God's hands. The text is a copycat of ancient Vedic texts which also refer to Adimo. Do you have any citations from earlier Vedas? I am very fascinated by this idea. The Vedas are Hinduism's primary and most authoritative sacred texts, dating back to 6,000 BC. You will find different creation stories in Hinduism. The story of Adimo springing from Brahma's hands stresses the concept of emanation from the Deity/Divine. In other Hindu stories God made the world and created man by calling him forth from the earth. First his head appeared and then his whole body. God gave him a woman, and the two lived as man and wife, enjoying the fruits of the earth. They had four sons, for whom God made wives, and their children populated the four quarters of the earth. The name "Adimo" is simply the Sanskrit word for "first". The appearance of the word as a proper name is not attested in Vedic texts, suggesting that the word "adam" probably shouldn't be taken as the literal name of the first male in Genesis. Sorry Alice, but the Vedas are dated at only approximately 1200 BC, and thus post date the hebre bible. Portions of the Vedas, especially some Brahamic material, predate 1200. The priest manuals didn't suddenly appear, but represent an already well developed religious office. Also, the entire Hebrew Bible is not part of this discussion. We are exploring Genesis, which may date to around the same period, if we accept the theory that Genesis is the work of a learned writer/editor associated with the Davidic monarchy.